When most people hear the name “Congo” they instinctively envision brutal civil wars, dense and impassable jungle and miles and miles of militia-controlled roadways. While these aspects of the Congos are very much a reality, there are still some options for independent travel throughout the region. In this article we’ll focus on The Republic of Congo otherwise known as Congo-Brazzaville, the slightly less intimating of the two countries (Republic of Congo and The Democratic Republic of Congo). So to answer the question that is no doubt on your mind if you’ve gotten this far in the article….Can I backpack across the Republic of Congo? Simply put…Yes! And here is the basic information that you’ll need to do it. As the countries capital, second largest city and most likely your first entry point into the country, Brazzaville is a better introduction to Africa than most other large cities on the continent. Just across the Congo River from Kinshasa, Brazzaville is a more chilled out version of its wild and crazy neighbor to the east. In fact, Brazzaville and Kinshasa are the world’s two closest capital cities. Most people who go to Congo-Brazzaville go for the parks, so we’ve listed those first. However due to their price and remote location they are typically out of scope for most backpackers. That being said, if you got time and money they are well worth a visit. Odzala is probably the hardest to reach out of all the parks in Congo-Brazzaville, but luckily if you’ve got the money they offer one of the most comfortable and high-end safaris in all of Central Africa. The most common way to visit the park is by flying directly into the airport at the Mboko airstrip inside the park. You can also reach the park via 4×4 assuming roads are in good condition. Alternatively you can take public transit to Etoumbi where you can organize a pick up with Wilderness Safaris. The camps in Odzala are high-end luxury camps. They offer comfort and convenience in a very remote part of the country. This is the standard way to visit the park and includes all food, transport permits and lodging. It is usually done via flight to Mboko airstrip and costs around $10,000 USD. Typically three nights are first spent at Ngaga Camp and then three nights are spent at Lango Camp. You can also organize shorter or longer tours of the park by contacting Wilderness Safaris directly. They are also all inclusive and cost approximately $1000 per day, per room. 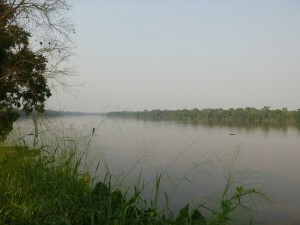 Nouabale Park is the Congo portion of the Sangha Trinational Park that extends from Congo into CAR and Cameroon. The park has large populations of western lowland gorillas and is famous for its clearings that make viewing wildlife relatively easy. The park was made famous in the 1990’s by National Geographic when they called it the world’s Last Eden. All trips into the park begin with making a reservation with the Wildlife Conservation Society at least a month in advance. Once your booking is confirmed you can arrange your transport method. Starting from Ouesso, you will need to hire a taxi (40 Mins) or take a boat (2 to 8 Hours) to the park headquarters in Bomassa. The boat ride costs around $400 (one way), whether it’s from WCS or elsewhere. For an easier trip, there are flights directly into Bomassa. From Bomassa you have two possible options (Mbeli by Jeep/Boat or Mondika by Jeep/Boat/Hike). Alternatively, you can fly directly into Pokola. There is accommodation and tours that frequently start from here. This relieves the need to worry about additional camps or transport methods. There is no public transport past Quesso and once inside the park, there are few roads so all travel is done by dugout canoe. The main draw here is the near circular lake located in the middle of the reserve. On top of this, there is plenty of wildlife on display including lowland gorillas. On top of that, there is the mysterious dinosaur-like creature that is said to live in the lake…although this has never been proven. Again, start by contacting the Wildlife Conservation Society. To get there, take a flight from Brazzaville to Impfondo. If you want to take the scenic route, the barge will make its way there in about 9 days from Brazzaville to Impfondo. Once in Impfondo, take a jeep to Epena. From there, its all on foot and your tour operator should coordinate the rest. This trek cannot be done independently. Prices for one-way trips range anywhere from $25 to $45 USD depending on which leg you are traveling. You should book your tickets at least one day in advance. The buses are reasonably comfortable with each person getting their own seat. Sometimes you might even get air-con. The journey is also relatively easy and your biggest issue will no doubt end up being the constant bribes/fees to the numerous checkpoints along the road. On the way from Ouesso to Brazzaville, we counted eight checkpoints over the course of the twelve-hour journey. 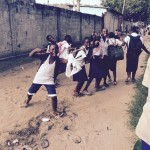 Owando is the halfway point between Brazzaville and Ouesso. It has a hotel and some places to grab food and supplies. Overall there is not much here to keep you busy. 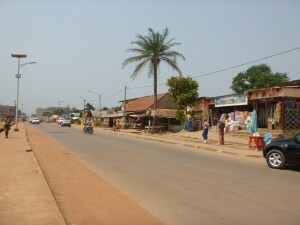 Makoua is a better place to catch onward travel. It’s a small sleepy town located right on the equator. It has a few small shops and restaurants (at least one serving Monkey) and a dingy looking park near the edge of town. There’s also an outdoor bar near the central roundabout to grab a drink if you find yourself with nothing to do. The best rooms in town are at the Hotel la Fleur (air-con, TV and clean sheets). With its wide roads and manicured shrubbery, Oyo will surely stand out. But why on earth would such a remote small town have such nicely shaped bushes? It could be because it is the birthplace of the countries president. The final stop on your journey north is Ouesso. This is where the transit and the road run out. It’s a decently sized town with a few places to eat, but expect slow service and menu items not in stock. The best place to stay in town is Nianina Hotel (About $50 USD per night). Ouesso has a large Pygmy presence, so you’ll definitely seem them walking around but in western-style cloths. In fact, they aren’t so easy to spot as they blend in as just shorter people. Also, the term “Pygmy” is a racial slur so try not to throw it around to liberally. Point Noire is the countries most modern and cosmopolitan city. In fact, it feels almost like another country. It’s the countries most populated city and over the years has been overhauled by the large expat community that works in offshore oil drilling. Here you’ll find all the trappings of a modern city…international cuisine, bars, nightclubs, hookers and money. It doesn’t look much like the rest of Congo, but at least you won’t get bored. 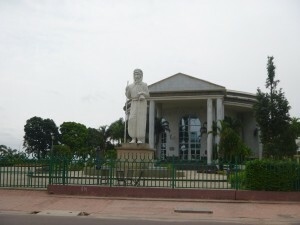 Dolisie is Congo-Brazzaville’s third largest city but not much goes on here. It’s more of a transit hub than an actual destination, but if you find yourself here you’ll have amenities and hotels to choose from. Located right on the coast, the Parc National Conkouati-Douli has the widest variety of all the parks in the RoC. The park streatches from the Atlantic ocean, into the savannah, up into the jungle highlands. The biggest draws here are the island dwelling chimpanzees and the sea turtles that nest on the beach. There are trucks that leave Pointe Noire that pass through the park en route to Gabon (about 5 hours). Get off at the village of Conkouati. This is where you can base yourself for visits into the park. There is a lodge nearby. So that’s it! The Republic of Congo is definitely backpackable. The major downsides include expensive prices for parks, French language and military checkpoints nearly everywhere. If you can handle those, you’ll be just fine.